Are you a chocolate lover? Well this cookie is for you! My Triple Chocolate Chip Cookies are a sweet chocolate dream come true. Made with milk, white, and semi-sweet chocolate chips with a hit of irish cream. How can you go wrong with those amazing ingrediants. Definately a top cookie among my faithful customers. 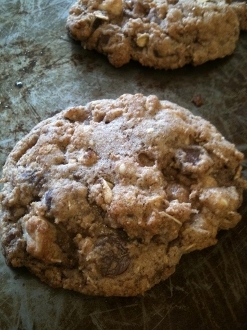 Made with 100% whole wheat flour and rolled oats.